Adventure Time: Hey Ice King! Why’d You Steal Our Garbage?! Was presumably delisted at the end of 2016 alongside Adventure Time: Explore the Dungeon Because I DON’T KNOW!, also published by D3 Publisher and developed by WayForward. Adventure Time: The Secret of the Nameless Kingdom was also delisted around this time but only on Xbox 360. 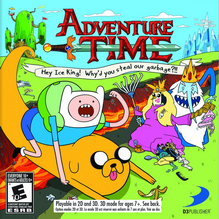 “Hey Ice King” remains available on physical media for Nintendo 3DS as well as the original Nintendo DS. “This is the first video game based on the radical, Emmy nominated Cartoon Network show about Jake, a wise dog with a big kind heart, and Finn, a silly kid who wants more than anything to become a great hero. Adventure Time show creator Pendleton Ward is heavily involved with the game creation, including the design of a brand new storyline and concept. Set out on heroic quest in a unique action adventure experience!